Massachusetts Avenue Park was not a place you would want to take your kids. Before, the small neighbourhood park in the heart of Buffalo’s West Side was little more than vacant land with a small playground and a crumbling basketball court. “It was a real mess,” says Terry Richard, a neighborhood resident who was born in Trinidad and Tobago and later moved to Buffalo by way of Brooklyn. “So we figured… why don’t we just take this on as a task to really force the city’s hand to take care of their problem,” she adds, standing next to the park’s new playground with a bright smile. Buffalo is located where the waters of Lake Erie feed into the swift currents of the Niagara River. It was established as a major grain shipping and storage centre in the late 19th century, but as shipping routes changed and heavy industry packed up and left the Great Lakes region, Buffalo’s population rapidly declined. In 1950, Buffalo’s population was about 580,000, but by the 2010 census it had fallen to about 260,000. It isn’t just the population that’s been shrinking though: Employment numbers are down, and like other Rust Belt cities, Buffalo has struggled to support its infrastructure with a shrinking tax base. The rebirth of Massachusetts Avenue Park echoes many other stories taking shape throughout the city. Instead of waiting for the city to make things better, residents like Richard are taking matters into their own hands. Richard is a board member for People United for Sustainable Housing (PUSH), a grassroots organization based in Buffalo that seeks to provide affordable, environmentally friendly housing and job training. In early June PUSH celebrated the opening of Phase 1 of the small but pleasant new Massachusetts Avenue Park, which resulted from about two years of petitioning City Hall to fund the project. The park is just one piece of PUSH’s broader plan to create a Green Development Zone within the West Side — a 25-block area where the group is developing sustainable, affordable housing and creating new career pathways for neighborhood residents. Like many Buffalo neighborhoods, the West Side is full of vacant properties, and PUSH co-founders Aaron Bartley and Eric Walker wanted to know why. When they launched the organization in 2005, their first order of business was to conduct a survey of Buffalo’s West Side, which meant going door-to-door in the community for about six months. With a bit of digging, they discovered that a sub-agency of the New York State Housing Finance Agency was in control of nearly 1,500 tax-delinquent properties in the city — about 200 of which were on the West Side — that were being left to rot. In 2003, the state of New York’s Municipal Bond Bank Agency bought the delinquent tax liens for those homes, which were then bundled and sold as bonds to investment bank Bear Stearns. But there was one major problem: According to a report published in Artvoice, Buffalo’s main alternative weekly, the assessed value of the properties was much higher than they were actually worth. In effect, the state was using vacant houses in Buffalo to speculate on Wall Street. Eric Walker, co-founder of PUSH, promotes the mission of creating strong neighborhoods with hiring opportunities and community resources. Photo: TEDxBuffalo. The value of bonds was based on revenue that was supposed to have been generated by the houses, through either selling them or collecting unpaid taxes. But the state made little effort to sell or collect taxes on the properties. Why? Because doing so would reveal the true value of the properties, according to Bartley, and the house of cards would come crumbling down. “The reason they didn’t do that is that would’ve shown the lie to the deal, because they would have sold for $0, and it would have indicated that it was worthless,” Bartley explained. When Bartley and Walker made the discovery, they tried to bring it to the attention of state officials through standard channels, but when that failed they launched a direct action campaign. Using a big stencil, they painted an image of then-Gov. Pataki’s face on more than 200 houses across the city. Eliot Spitzer was campaigning for governor at the time, and he took an interest in the issue. When Spitzer took office, his administration unwound the bond, gave the houses back to the city of Buffalo, and created a small housing rehab fund. The houses were turned back into the city’s inventory, and when PUSH or one of its partner organizations wants to redevelop one, they ask to have it transferred. Two years later, PUSH invited hundreds of residents to a neighborhood planning congress to draft a development plan for the largely blighted 25-block area on the West Side that would later become the Green Development Zone (GDZ). The plan went far beyond energy-efficient affordable housing to include the creation of employment pathways and promoting economic stability within the zone. 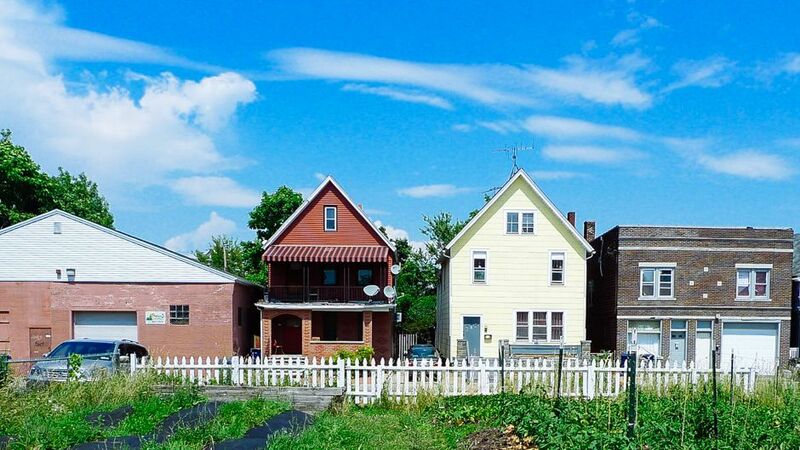 On the surface, the GDZ still looks similar to other Buffalo neighborhoods: The streets are lined with 100-year-old two- and three-story houses, and in the summer, they teem with people. Old ladies sit and talk on first-floor balconies, while kids weave in and out of slow-moving traffic on bicycles. But this small neighborhood is in the midst of a pretty radical transformation. “Sustainability” in the context of PUSH’s agenda means reducing the neighborhood’s environmental impact, but also strengthening the local economy and creating green jobs in the building rehabilitation and weatherization industries. PUSH was instrumental in getting the Green Jobs – Green New York legislation passed, which seeks to create 35,000 jobs while providing green upgrades and retrofits for 1 million homes across the state. PUSH recently established PUSH Green to implement the GJGNY program in the Buffalo area, functioning as an independent outreach contractor in the region. For the work, PUSH has established what it calls a “Community Jobs Pipeline,” a network of contractors who agree to provide job training, pay living wages, and hire local workers from target populations. In September, PUSH held a ribbon-cutting ceremony for three gut-rehab buildings with a total of 11 affordable housing units, bringing the total number of residential units PUSH completed in the GDZ to 19. PUSH renovation in Buffalo’s Green Development Zone. Photo: Whitney Arlene Crispell / PUSH Buffalo. 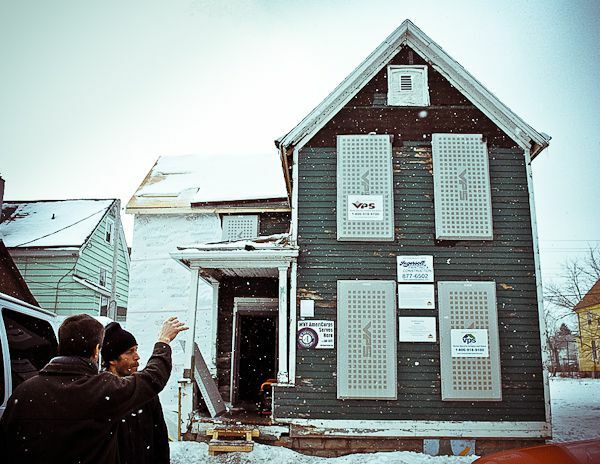 Ensuring that the homes it produces are energy-efficient is an important component of PUSH’s work, because heating and energy costs account for a large percentage of living expenses in Buffalo. “A lot of the houses in this city are over 100 years old and poorly insulated, so to have an apartment at an affordable rate but also that is totally energy-efficient, through the new windows and insulation, the utilities bills will be drastically reduced,” McClain told me. Green buildings enjoy lower operating costs, but they’re more common in luxury real estate portfolios than in the inner city. That’s a perception that PUSH is looking to change. In 2011, PUSH completed a net-zero energy house — a home that produces as much energy as it uses. The project was launched to showcase renewable energy technologies and to help give low-income residents paid job training. In the process, the builders found another innovative use for vacant lots: They dug a deep trench in the adjacent lot to provide geothermal heating and cooling for the house. On all of the buildings, PUSH reuses existing materials where possible, upgrades the windows and insulation, and installs Energy Star-rated metal roofs that help to passively cool the buildings. Back at the PUSH headquarters I met co-founder Eric Walker, who I instantly recognized even though we had never met. Walker guest-starred on an episode of ABC’s reality TV show Extreme Makeover: Home Edition that aired in 2010. In a typical episode of the show, a handful of hyperactive celebrities and local volunteers target a distressed home that is owned by a family undergoing illness, disaster, or some other hardship, and they quickly fix it up for the family in need. Instead of just fixing up one house, though, PUSH and some 4,500 volunteers teamed up with the show’s producers to fix up several surrounding properties in the neighborhood as well. Extreme Makeover brought the West Side some positive national exposure, but Walker still has mixed feelings about the show. Neighborhood improvement can either come from external forces or it can come from within, and the forces of change portrayed in the show weren’t entirely homegrown. “In organizing, we talk about three kinds of power: power over, power for, and power with,” explains Walker. The TV show gave PUSH an opportunity to inspire, but the tools of change were in the hands of the ABC producers and the celebrity hosts — not members of the community. “It was one step removed from the power we’re trying to build,” Walker says. The TV cameras packed up and left, but the transformational power remains in the neighborhood. It is evident in the carefully restored Victorians that line Massachusetts Avenue; in the raised beds the community has acquired through PUSH; and in the fact that parents now take their children to the once-dangerous park they fought for and won themselves. 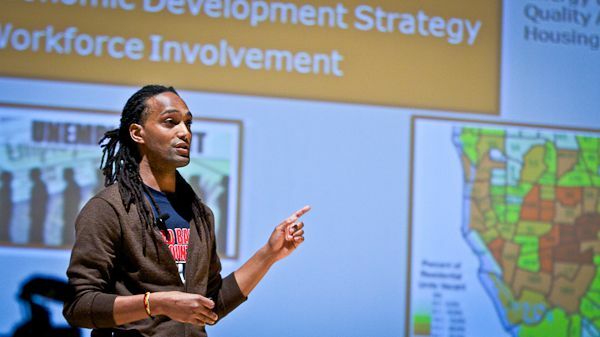 Check out Eric Walker’s talk at TEDx Buffalo. Green Housing: in Buffalo, It’s not Just for Rich People Anymore by Mark Andrew Boyer is licensed under a Creative Commons Attribution-NonCommercial-ShareAlike 3.0 Unported License. Based on a work at http://www.yesmagazine.org/people-power/green-housing-in-buffalo-its-not-just-for-rich-people-anymore. Mark Andrew Boyer is a photographer and writer based in the San Francisco Bay Area. His work has appeared in GOOD, Inhabitat, and Mindful Metropolis.